Jamila Norman is an internationally recognized urban farmer, food activist and mother based in Atlanta, GA. She is a University of Georgia graduate with a degree in Environmental Engineering, After 10 years in her professional career, Jamila has now committed fully to operating her independent, organic urban farm, Patchwork City Farms, which she founded 2010. In 2014 she served as a US delegate to Slow Food’s Terra Madre Salone del Gusto, an international event dedicated to food and gastronomy, in Turin, Italy. She and her farm have been featured in various publications including Modern Farmer Magazine, SeedStock.com, The Library of Congress and Southern Foodways Alliance oral history project, and Farm Star Living to name a few. Passionate about promoting healthy lifestyle choices, Jamila is a practicing yogini and longtime vegetarian. Her love of globally inspired cuisine has deep roots. 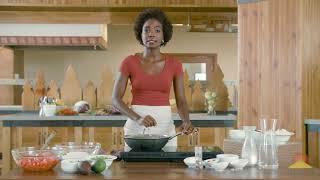 The oldest of 6 children, she gained experience cooking from a young age from her Jamaican and Trinidadian parents. Her training continued as a mother and is now being honed as she works to inspire people to incorporate the abundant harvest of amazing and beautiful produce grown at her farm and available to them. In addition to her farm, Jamila co-founded EAT Where You Are, an initiative focused on incorporating more fresh and living foods into our diets. She is also a contributing writer for the anthology, OASIS (Oldways Africana Soup in Stories), a publication of culturally-informed soup recipes that seeks to foster and expand conversation about nutritional knowledge and Black women’s wellness.